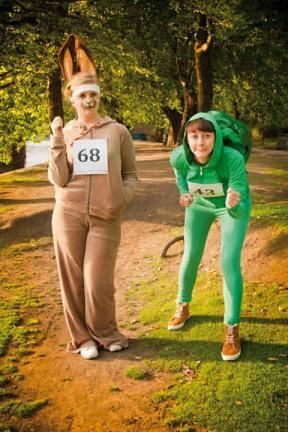 While they may not all be spooky, these running costumes are great for a themed group run or even going door or door. So tie up the running shoes and get in the spirit of the holiday. A set of grey sweats and plain white number 261. 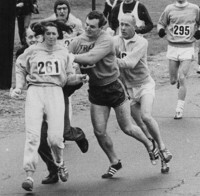 Bonus, make it a group costume and get someone to dress up as race director Jock Semple and Thomas Miller. Prefontaine’s was a long distance runner who competed in the 1972 Olympics. His career, alongside those of Jim Ryun, Frank Shorter, and Bill Rodgers, generated considerable media coverage, which helped inspire the 1970s “running boom.” He was known for his mustache and his long locks of hair that parted as he ran. Large fake mustache, sideburns, a white USA tank, and short short track shorts. It’s a classic racing story that everyone knows. Plus it’s a fun couples costume. The question is, who gets to be the Tortoise and win? Hare- a tan or brown tracksuit or shirt and leggings, Rabbit ears, and get ready to sprint everywhere you go. Tortoise- Green shirt and leggings. Cover a stuffed backpack in a darker green cloth for your shell. Walk everywhere really slowly. 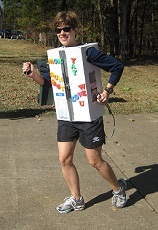 Is your refrigerator running? Better go catch it! Turn this old prank call into a fun costume. Plus you can see if anyone gets the joke. White cardboard box with arm and head holes. Draw handles and doors on the front. Add fun items like magnet letters and family photos. Pair with running shorts and shoes. A staple part of every long-distance runner’s life. They can be your lifesaver or your worst nightmare. Cardboard box with an extra piece to make the roof. Pant the box blue to look like a port-o-potty. Carry around extra toilet paper. High Five Events is excited to announce Ascension Seton as the title sponsor of the Austin Marathon. The multi-year agreement includes naming rights, race weekend activations, and community engagement opportunities. Additionally, Ascension Seton will be the Official Medical Provider of the Austin Marathon. The Ascension Seton Austin Marathon presented by Under Armour® will take place on February 17, 2019. As the Official Medical Provider, Ascension Seton doctors and nurses will staff the finish line medical tent and work with Travis County EMS on course. During race weekend, Team Ascension Seton will participate in all events. They’ll also volunteer their time and have a major presence at the Health and Fitness Expo. Their presence will be felt outside of race weekend as they get involved with local running clubs and attend community runs. They will raise funds and spread awareness as an Official Austin Gives Miles charity. Ascension Seton is part of the largest nonprofit health system in the U.S. and the world’s largest Catholic health system. The Austin Marathon will celebrate its 28th year running in the capital of Texas in 2019. Austin’s flagship running event annually attracts runners from all 50 states and 30+ countries around the world. Having start and finish locations in the heart of downtown Austin puts participants and spectators near all the action and within walking distance of restaurants, hotels, and shops. Finishing with the picturesque Texas State Capitol as your backdrop is icing on the cake for the perfect running weekend destination. Participants can register on the Austin Marathon website.